Clydebank continue to sit second in the West Premiership table after a battling 2-1 win over Cambuslang Rangers on Saturday. 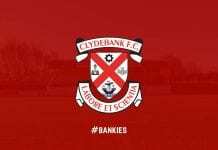 Jordan Shelvey opened the scoring for Bankies, who were pegged back by John Gemmell’s penalty kick, before Steven Higgins added a second as Clydebank picked up their ninth game of the season. Boss Kieran McAnespie made four changes to the side that crashed out of the West of Scotland Cup to Glasgow Perthshire, as Marc Waters, Adam Asghar, Alan Vezza and Cammy McClair all earned a recall to the starting eleven. After a quarter of an hour, Bankies took the lead. Del Hepburn intercepted Gemmell’s cross field ball and released Jordan Shelvey through on goal. The striker took his shot first time and slipped the ball beyond the onrushing goalkeeper for his ninth goal in ten starts. But less than three minutes later, Cambuslang were level from the spot. Full back Lewis Kinnard’s ball over the top took out the Bankies back line, and Gemmell was the man to be brought down by the advancing Waters. Gemmell took the resulting penalty himself, sending Waters the wrong way and tucking the ball into the bottom corner. Cambuslang were dangerous on the break and could’ve went ahead soon after. A good move saw overlapping winger David Galt’s driven cross fall neatly to Ramsay, but Waters redeemed himself with an excellent block. Nine minutes before the break, Bankies got the decisive second. Good control out on the right flank saw McClair bring Darroch’s pass down and set up Higgins, who took a touch before stabbing home with the outside of his boot to register his fourth goal in three games. Chances were few and far between in the early stages of the second half, with only Scott Morton testing Waters with a fizzing right footed free kick that the keeper gathered at the second attempt. It wasn’t pretty at times, but it was the hosts who had the most clear cut chance to take the lead. Gemmell out-muscled Jamie Darroch to the ball and released Galt down the right once again, with his cut back finding substitute Callum McRobbie. Defender Declan Fitzpatrick threw his body on the line to deny an almost certain goal as the travelling Bankies support breathed a sigh of relief. At the other end, Bankies had the chance to extend their advantage but were denied by the woodwork when McClair’s effort crashed off the post after good work down the left by goalscorer Shelvey. But deep into injury time, the main flashpoint of the game saw Cambuslang reduced to ten men as defender Jack Breslin was dismissed. Breslin appeared to push Hepburn – who was down injured at the time – off the field of play and was shown a second yellow card by referee Matthew MacDermid. Bankies are back in Scottish Junior Cup action this weekend, when they travel to take on Royal Albert in the fourth round. Kick off at Tileworks Park is 1:45pm.